It was towards the very end of my one week trip in Vietnam. I was coming back late at night from Hanoi for one more day in Ho Chi Minh City, when it happened. For a week I had been marveling at the way the car drivers and scooter steerers had created a kind of musical movement on the road. Everyone was constantly swerving and swarming in every which direction, and not once had I seen an accident. Not even a tap with a side mirror. This late night trip home made up for it. 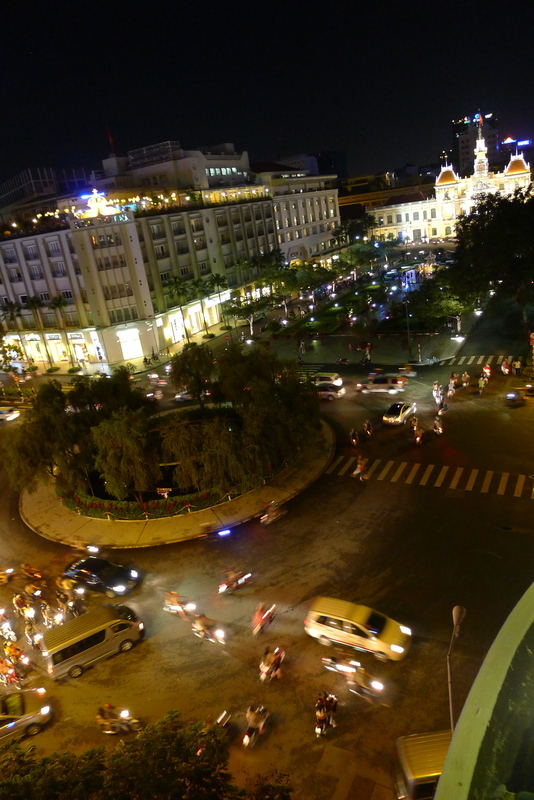 At night, the trucks are allowed to enter Ho Chi Minh. I was noting this coming off the highway because trucks on the road was such an unusual sight. The bridges were usually packed with scooters and taxis. Tonight only trucks and myself. Coming around a turn, there it was. A dark empty road. A tipped black vespa. A truck parked on the curb with the driver on the phone. And in the middle of the road, one woman. The contents of her person were spilled all over the pavement next to the contents of her purse. The ambulance was a long ways off, if it was coming at all. Unfortunately the most shocking part of all this might have been the conversation I had the next morning with a friend living in Ho Chi Minh. As I relayed the story, she stopped me. “Did it look like the truck hit her going forward or backward?” I stared blankly. I had already told her the truck was in front of the scooter… Why would a truck REVERSE over someone and then pull back up in front?! I couldn’t wrap my mind around it, but my friend already knew why. In Vietnam there is a law stipulating compensation structures for scooter accidents, and I can see why they thought this was a good idea given the large numbers of scooters on the road. The catch is this: if a scooter is hit by a car/truck and there is a death, the car/truck driver is required to pay the family a one-time lump sum. If a scooter is hit by a car/truck and there is only an injury, say a lost limb or brain damage, the car/truck driver is required to pay the family compensation in installments, for life. Any behavioral economists (or just a rational person for that matter) reading this will already know where I am going. …As soon as this law came into effect, there was a spike in fatal accidents. Not because the accidents were getting worse, but because car/truck drivers were making sure they wouldn’t be stuck with lifelong payments. They began hitting the victims again, in forward or reverse, to make sure they were dead. Turning accidents into murders. That is the power of incentives. And hence, the questions I couldn’t answer: How many times does a person need to be run over to be in the state I saw? Was the girl I saw accidentally killed or purposefully murdered? The one thing I do know is, that I will never know. Note: All data in this post was collected from personal interviews. If you have any personal experience with this or relevant reading, please share so that we can make the information here as accurate as possible. One of your best photos……Reminds me of the figure 8 trailer demolition contest at the racetrack in Elko.I would never understand what you were describing without the photo. One driver has the front end in the air..You are very brave.